It was recorded sometime in 1963. I wonder if Al sang on it? The vocals sound so full, I would imagine he's there. I remember this question of Al being on there was hashed out in great detail several years ago. It's buried on this board somewhere. This might be my favorite A capella song by them with a close tie to Lavender. Beautiful. 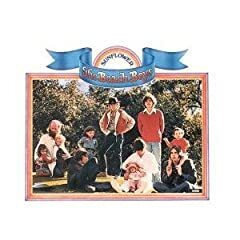 I really didn't want to "start a new topic" for this random question, so I located this older thread, but I've been compiling for a long while a Beach Boys anthology from their recording sessions and was wondering if the 1963 recording of "The Lord's Prayer" was the recording they considered for inclusion during the original Sunflower (Add Some Music) sessions? Or if not, was there a different recording? My thoughts EXACTLY. And yes, I do think Al is in there somewhere up towards the top, but of I can't be sure. Religion is a privilege, not a right. It's easiest to tease these apart on the very last line, and that's where the troubles began. Vocal A was definitely a Wilson and if I had to guess I would have said Dennis. No way it's Al...the tone is too "round". Vocal B could be either Carl or Alan, but not Dennis. Likewise, too grainy/nasal. From a default standpoint, I would have then said (in this order) Mike, Al, Carl, Brian. Vocal A is high, it's tricky, and unusually for Dennis, he never sticks out in the mix, so it's obvious to ascribe it to Carl. Also, Al clearly dominates the stack at the "daily bread" line. Yet, Vocal B sounded a little soft and round for Carl, and there were parts I felt I heard Carl clearly at Vocal A. Plus, Carl's default position was below Al in the stack, although that doesn't seem to have always been the case. So I went back to the "daily bread" line and listened more carefully. Even though the phrasing of that sounds exactly like Al's, if you listen around that line where the doubling comes apart slightly (it's most pronounced at "evil") and you can hear the individual vocals on that part, suddenly you hear Carl. Then listen to "power" and "glory". Vocal B is the one that's moving more, Vocal A is the one that has lest movement. "Power" is much more Carl-like but more importantly, "glory" is unmistakably Dennis (listen to the way he hits the "ry"...he scoops up to the note). Also listen to Vocal B at the closing "amen" where it comes apart slightly. You can hear the individual voices and it's clearly Carl. So Al's presence on the song, seemingly obvious, would appear to be an aural illusion created by Carl's voice being doubletracked in that range, which would make him sound grainier in spots and more Al-like. Hi, new member here. I was listening to the '67 attempt at the Lord's prayer, and I believe you can hear Brian, Mike, Carl, and Al all remembering their parts. Please let me know if I'm not hearing this right. This is incredible! Thanks, c-man, for excavating this astonishing analysis by Mr. Marsland. Hi Austin and welcome. Maybe some clever person (Adam M.?) has the parts written out and can check for you. I think you're correct. If you listen to the recording at the very beginning, it's Dennis in the distance yelling "The Lord's Prayer!!" at the others, in effect requesting the song. Brian name-checks him. I think this probably solves that mystery. And wow, listen to Brian play the arrangement on organ. So freaking complex. Instead of creating a new thread, thought this would be an appropriate place to ask, given the above discussion: I'm (for some crazy reason) attempting to do a cover of this song for Christmas, and it'd be really helpful if anyone would happen to know the time signature for this song. Beautiful performance indeed, but can one really imagine that the Boys offered this one to be on their last Capitol album? Talk of scraping the barrel. It changes throughout. Or more accurately, it has none. Hi TMS. Assuming it's nowhere online, I'll have a go at writing it out for you and posting it here. But I doubt if it will be ready for Christmas. I'll post it once I find the time to organize it. I'll be interested to see how you situate it rhythmically. I think it makes more sense to leave it unmetered, like one might an edition of 16th century polyphony. Let it be free from the shackles of pulse! You've convinced me, H. I'd hate to put Brian's gem of an arrangement in a straitjacket! Maybe there need only be a bar line between each phrase. To be continued. I'll do this once I get hold of a notation software program. Folks, is MuseScore reliable? I don't need any fancy features, just a way of writing out music legibly. It's fine. It's not as flexible or versatile as Finale or Sibelius, but I use it frequently for lots of things and it does the job. For free!!!!!! Thank you for mentioning that...I’m gonna need it for an entirely different project! Powered by SMF 1.1.21 | SMF © 2015, Simple Machines Page created in 0.241 seconds with 22 queries.